There are numerous ways to structure a trek because of two major factors. Firstly, you can almost always find supplies and accommodation locally because there are people living in even the most remote trekking areas. Secondly, there is inexpensive professional and nonprofessional labour available to carry loads and to work as guides and camp staff. The traditional trekking approach of a light backpack, stove, freeze-dried food and a tent is not appropriate in Nepal. So much food is available in villages that it doesn’t make much sense to try to be totally self-sufficient while trekking. You shouldn’t trek alone. There are many times when it’s useful to have someone to watch your backpack – when you have to run off the trail into the bushes, or even when you are in a lodge and go to the toilet. It’s also good to have someone around in case you injure yourself or fall sick while walking. 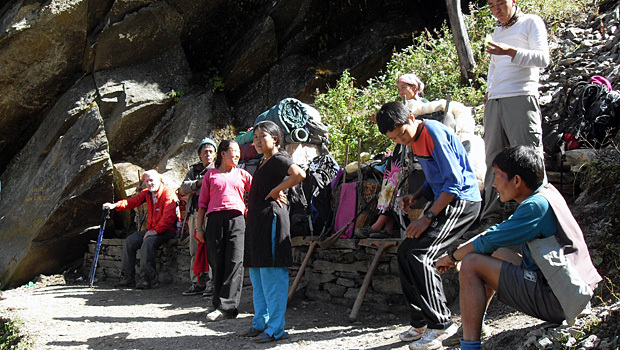 Almost all deaths, disappearances and incidents of violent crime in Nepal have involved trekkers travelling alone. If you do not already have a travelling companion, then you should find one in Kathmandu, either a guide or another trekker. There are two primary approaches to trekking: lodges treks and camping treks. The most popular way to trek is to use local trekking lodges for accommodation and meals. There are good lodges every few hours on treks in the Annapurna, Langtang and Khumbu (Everest) regions. In these areas you can operate with a bare minimum of equipment and rely on local facilities for food and shelter. In this manner, your trek will cost US$ 5 to US$ 20 a day, depending on where you are and how simply you live and eat. It becomes much more expensive at high altitudes and in very remote areas. By arranging your accommodation and food locally, you can move at your own pace and set your own schedule, making side (rips not possible with an organised group. You can spend a day photographing mountains, flowers or people, or you can simply lie around for a day. Lodges in the hills provide a special meeting place for trekkers from throughout the world. You are free to alter your route and change your plans to visit other out-of-the-way places as you learn about them. You will have a good opportunity to see how the people in the hills of Nepal live, work and eat and may develop at least a rudimentary knowledge of the Nepali language. Because you are relying on finding food and accommodation every day, you must trek in inhabited areas and on the better-known routes. You may need to alter your daily schedule to reach a certain lodge in time for lunch or dinner. Lodges have limited space and can be full, although most can find you a place to sleep, even if it’s only the dining room floor. The classic style of trek in Nepal is to camp in tents and employ porters to carry your gear and sherpas to set up camp, cook and serve meals. You carry a backpack with only a water bottle, camera and jacket. On a camping trek you sleep in a tent; this gives you a place to spread out your gear without fear that someone will pick it up, and probably means you will have a quiet night, away from the uproar of a lodge. In addition, a tent also gives you the freedom to go to bed when you choose. You can retire immediately after dinner to read or sleep, or sit up and watch the moon rise as you discuss the day’s outing. Because there are also tents for the sherpas, and often the porters, you do not need to camp near villages, and can trek comfortably to remote regions and high altitudes. A group camping trek follows a tradition and a routine that trekkers and mountaineers have developed and refined for more than 50 years. You can travel in much the same manner as the approach marches described in Hunt’s The Ascent of Everest, Herzog’s Annapurna and Ullman’s Americans on Everest, a feature not possible with other styles. If your interest in the Himalaya was kindled through such books, you still have the opportunity to experience this delightful way to travel.